Drawn from the romance of antique lace by Adeline Cordet, smokey glass beads, black lace and leather add a touch of mystery. Leather and Lace is one of my earliest patterns. It remains one of my favourites. 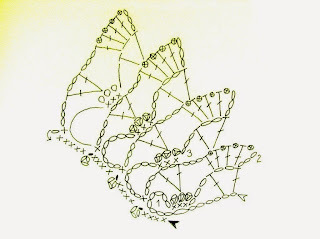 I have included a crochet symbol chart for the necklace. I hope you like it. 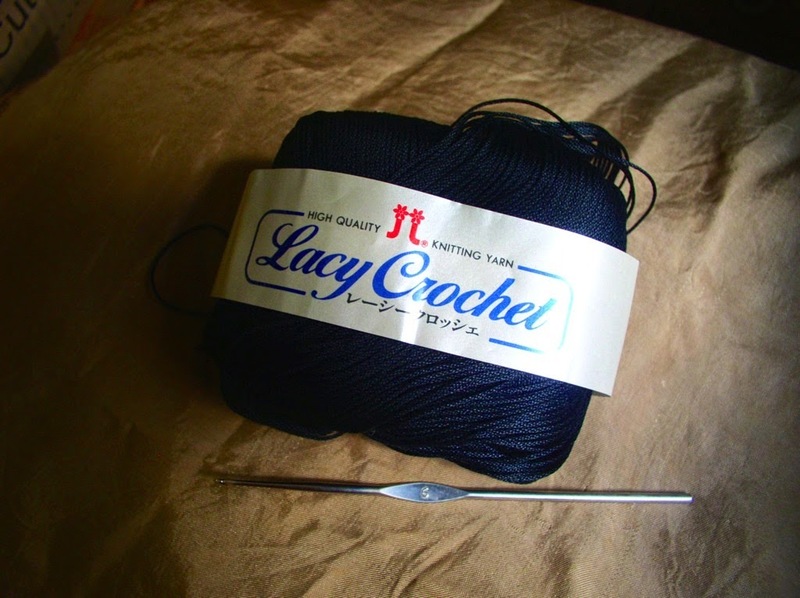 Note: For finer lace work, use size 10 thread and steel crochet hook size 0.95mm. 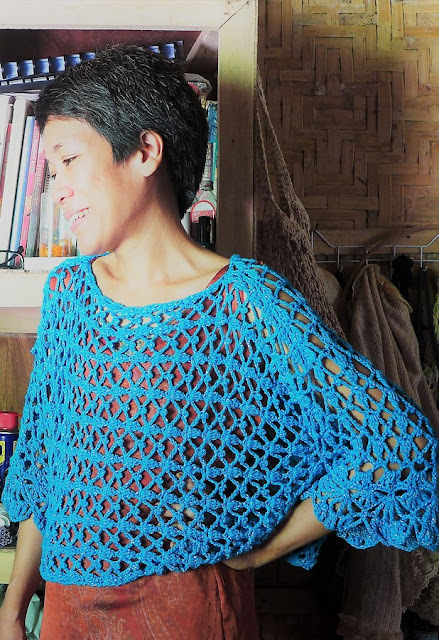 This pattern is written in US Crochet Terminology. 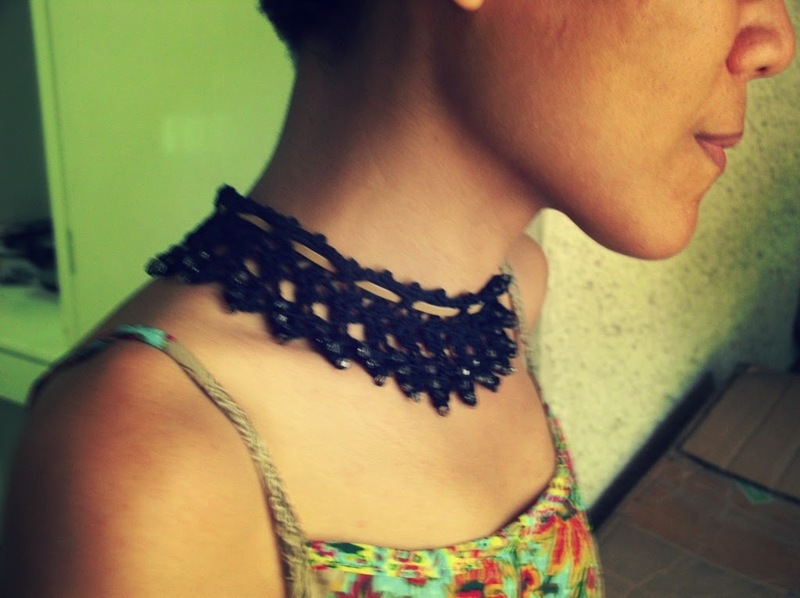 The necklace is crocheted starting from the narrow end. The beads are worked into the stitches such that the beads appear on the front facing the worker. There are four beads per scallop in this design. With Canon Crochet Cotton Thread size 8 and steel hook size 1.3mm, five scallops make approximately 3.0 inches in length. 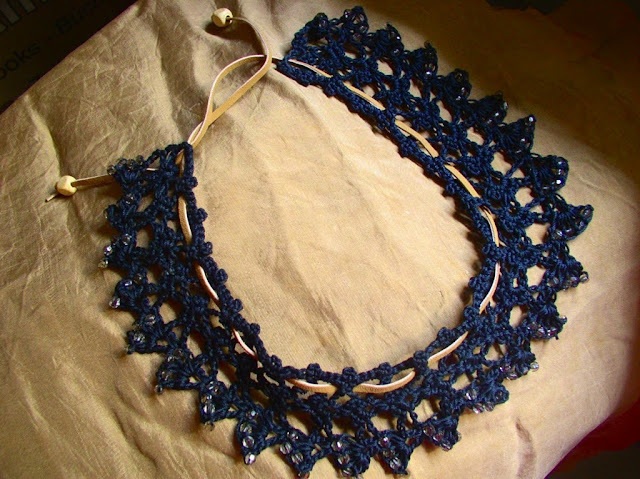 When done, the crocheted necklace is lightly starched to stiffen it and to protect the material from dust and dirt. Bead-dc: Slip bead close to hook. Yarn over, insert hook in ch-2 sp, pull loop through, keep bead at the front of the hook, then yo and pull through two loops on hook, yarn over and pull through all two loops on hook. 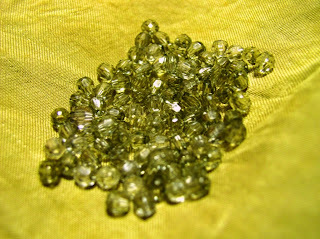 Preparation: String the glass beads onto the thread. You may use a flexible needle or you can stiffen the tip of the thread with colorless nail polish. There are 4 beads per scallop. This 14” long necklace has 25 scallops and thus 100 glass beads. 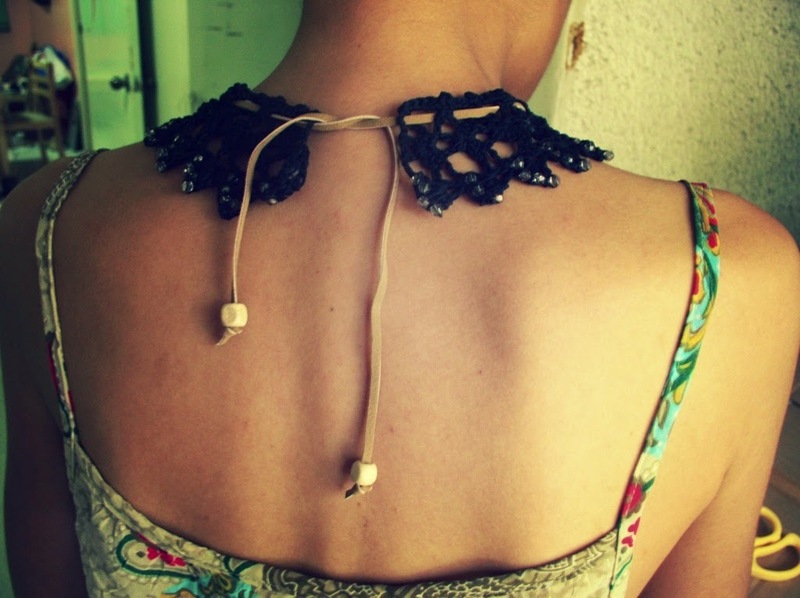 The standard choker length for women’s necklaces is 16 inches, my measurement is 14 inches. Take your own measurements whenever possible. Starting at the narrow end, ch 15. Row 1: (WS) Sc in 9th ch from hook (this makes an 8-ch loop). [Ch 3, sc in same st] 3 times, ch 3, sk 4 ch, dc in next ch, ch 2, dc in last ch. Ch 4, turn. Row 2: (RS) Bead-dc 4 times in ch-2 sp, ch 3, dc in second 3-ch loop, ch 2, dc in same 3-ch loop, ch 3, sc in 8-ch loop. Ch 8, turn. Row 3: Sc in 2-ch sp, [ch 3, sc in same sp] 3 times, ch 3, sk first dc of the 4-dc group, dc in second dc, ch 2, dc in same dc, ch 4, turn. Top row: Ch 1, 5 sc in ch-8 loop, *ch 3, sl st in sc at base of ch-3 (picot made), 5 sc in next ch-8 loop. Rep fr * all across the length of the necklace. Fasten off. 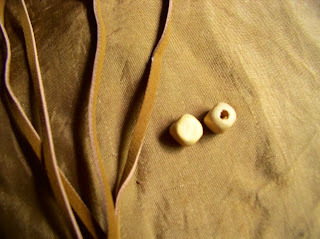 String the leather through the loops in the upper row as shown in the photograph above. Leave at least 5 1⁄2 inches of leather at the ends for tying. 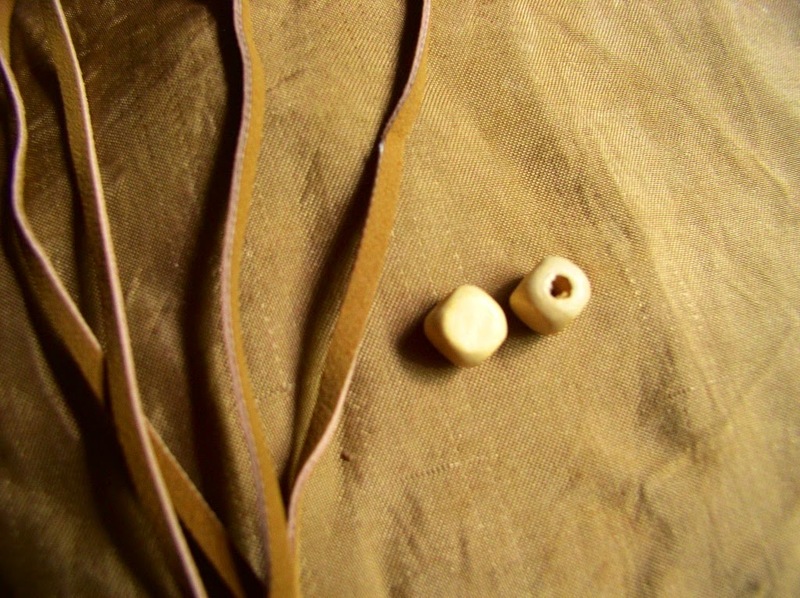 Insert wood beads and tie the leather ends into a knot. 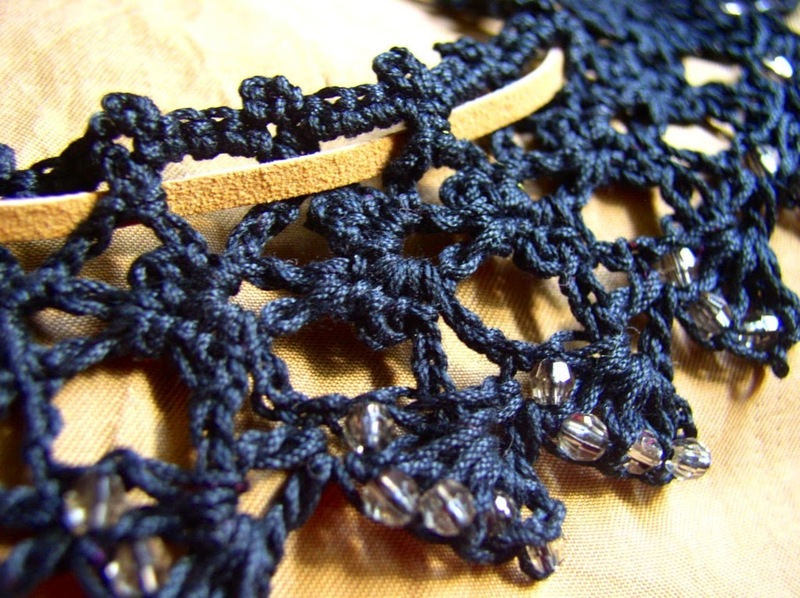 Lay the lace flat on a few layers of clean cloth. Spray or dab with commercial fabric stiffener. You can also prepare your own fabric stiffener as follows: dissolve 1 tsp cornstarch in one cup of water in a saucepan. Add a tsp of vinegar or salt as preservative. Bring to a gentle boil stirring constantly. Let cool and pour into a spray bottle. You can also use a brush to apply the starch solution instead of spraying. You can also dip the lace into the starch solution and press out excess with your fingers. 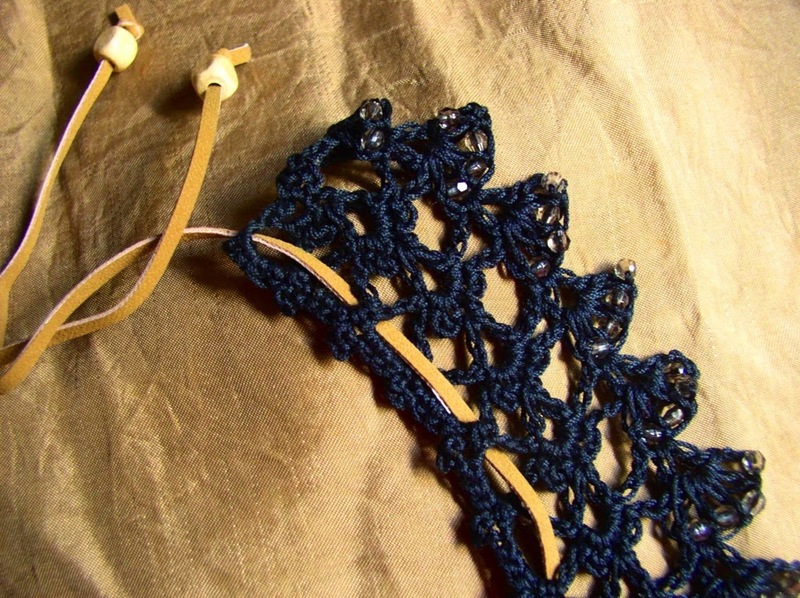 While wet, use your fingers to shape the lace. Pin to shape. When done, let the piece dry completely for at least two to three days.